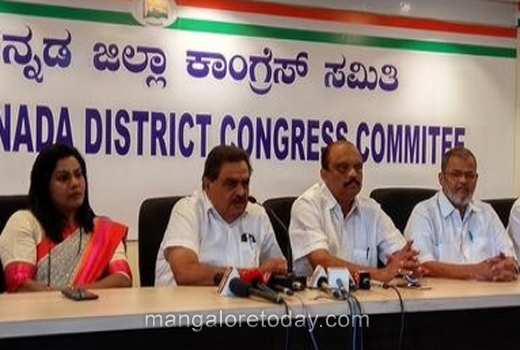 Mangaluru, Mar 24, 2018 : Janashirvada Yatre of Rahul Gandhi and his public meet at Nehru Maidan on March 20 has instilled confidence among Congress workers in the district. “Secular ideology gets more support in Dakshina Kannada district. Participation of a large number of people during the visit of AICC president Rahul Gandhi is a testimony to the fact that people are attracted to secular ideology,” Rai said, adding that the Janashirvada Yatre has evoked an overwhelming response. Congress in coastal district is fully focused on Assembly election. Party workers are actively engaged in booth-level campaigns for the party. Meanwhile, MLAs have been focusing on development of their respective constituencies. Rahul Gandhi’s visit has given an extra boost to party workers’ enthusiasm. Congress will fight election countering the hate campaigns of BJP using the language of love, Rai said, adding that the government has delivered all its promises. Rai said that Rahul Gandhi will visit the district again for election campaign very soon. In addition to Rahul Gandhi, the state Congress also has chief minister Siddaramaiah as party’s star campaigner. “Congress government has fulfilled all the promises it made. The BJP secured majority at the Centre by giving false promises and none of them was delivered. People have started questioning the Narendra Modi government,” he said.